To paraphrase the lyrics to the old television show “They’re creepy and they’re kooky, meet the Addams Family” as the Honeoye Falls-Lima High School students showcase their musical theatre talent by presenting The Addams Family on March 21, March 22 and March 23 at the District Auditorium. The plot of the musical comedy is not based on the television show or the two films, although it does begin with the familiar theme song. As the show opens, the Addams Family (father Gomez, mother Morticia, daughter Wednesday, son Pugsley, Uncle Fester and Grandma are visiting the graveyard for an annual gathering of all family members (living, dead and undecided) to celebrate what it is to be an Addams. Uncle Fester stops the Ancestors’ return to their graves to ask for their help as Wednesday has invited her new (normal) boyfriend Lucas Beineke and his parents, Alice and Mal, to dinner over the protests of her parents. Wednesday admits to her brother that love is pulling her in a new direction while Gomez and Morticia worry that she is taking this different path. What happens when the Beinekes arrive for the dinner? Come to the show and see the hilarity for yourself. For senior Riley Goold who plays the role of Morticia, this show will mark the end of her years on the stage at HF-L. Prior to a rehearsal last Monday night (March 11), Goold talked about being Morticia. The role of Morticia is something different for Goold. In her first musical in high school, she played The Bird Woman and was in the ensemble of Mary Poppins. As a sophomore, she played Mable in The Pajama Game and last year, as a junior, was Mrs. Marshall in Irene. Goold said that she loved the role of Bird Woman and being in the ensemble was fun because as an actor, you are doing many different things while the role of Mrs. Marshall was much more assertive. In some ways the assertiveness she showed in that role has been carried over to the role of Morticia, which is even more assertive. In that respect, being in the musicals the last four years has helped her. Senior Charles (CJ) Tomaszewski also brings down the curtain on his high school years on the stage in another comedic role, following on the heels of his bring-down-the-house performance as Madame Lucie in Irene last spring. 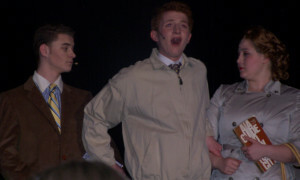 He portrayed Mr. Hasler, the owner of the Sleep-Tite Pajama Factory in The Pajama Game, as a sophomore and Von Hussler in Mary Poppins as a freshman. While he has enjoyed all the different roles he has had in the high school musicals, Tomaszewski admits that Madame Lucie and Uncle Fester hold special places in his heart. Asked what drew him to the role of Gomez, McDougall said it was the challenge of it. In addition to taking on a lead role like Gomez, McDougall also kept up with his studies and being a member of the boys swim team. All three students agreed that the experience of putting a show together is something that is truly incredible and amazing. 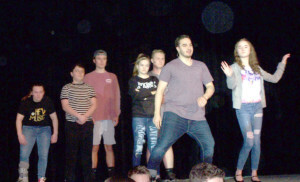 An article with the names of all the kids onstage in the show was in the March 14 edition of The Sentinel and an article with the names of all those students involved in the backstage aspects of the show will be in the March 28 edition. Showtimes for The Addams Family are March 21st at 7:30 p.m., March 22nd at 7:30 p.m. and March 23 at 2 p.m. and 7:30 p.m. at the District Auditorium. Tickets are $12 adults and $10 for students for all three evening shows and $10 for everyone at the March 23 matinee and can be purchased online at seatyourself.biz/hflcsd or by emailing the box office at hflboxoffice@gmail.com.